Is tomorrow’s fare increase fair? 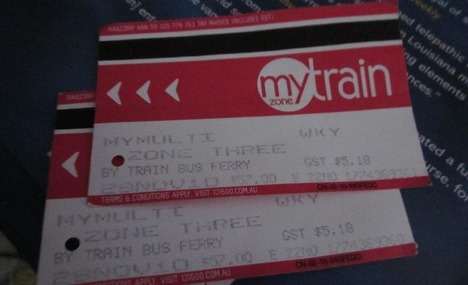 Fares for public transport in Sydney tomorrow (1 January 2011) are set to increase by an average of 5.4%. This is more than double the inflation rate of 2.3% (year to September 2011 excluding volatile items, the most recent data available – Source: Reserve Bank of Australia) and so, critics have claimed, the increase is beyond a reasonable increase. Public transport fares are set to increase by an average of 5.4% on 1 January 2012. Transport Minister Galdys Berejiklian has defended the increase by pointing out that fares were frozen last year, and so this increase in effect is the combined fare increase for 2011 AND 2012. With inflation for the 12 months to September 2010 of 3.0% added on to the above rate of 2.3%, the 2 year inflation rate of 5.3% is equal to the average fare increase of 5.4%. Ms Berejiklian also pointed out that IPART, the independent pricing body, had recommended a fare increase of 10.6%. On this occasion, I think the fare increase is reasonable. Real fares, adjusted for inflation, will be no higher on 1 January 2012 than they were on 1 January 2010 (the last time we saw a fare increase). Keep in mind that commuters in Melbourne are facing a 8.6% fare increase on the same day. The best bet, if you are reading this on December 31 and can afford it, is to buy periodical or multi trip tickets today before the fare hike. I’ll be buying a large number of myBus travel tens and effectively getting them at a 5.4% discount to the 2012 price. Following on from a previous piece on medium speed rail (MSR), Transport Textbook has followed up with a possible case study for Sydney to Canberra MSR. 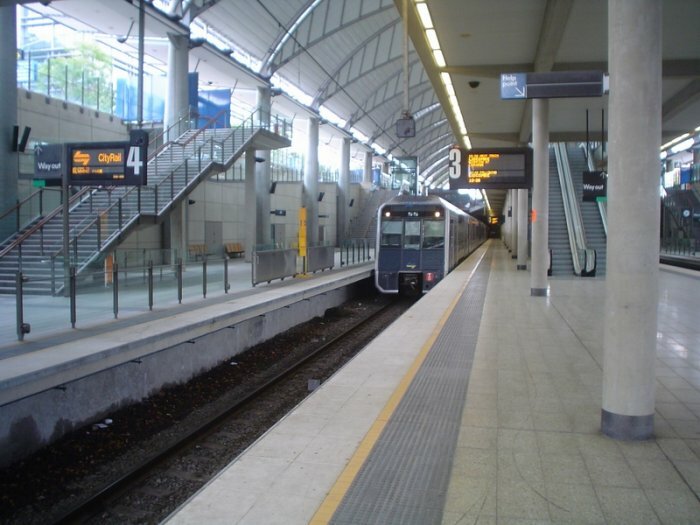 The argument goes that by using existing lines within Sydney rather than a long tunnel into the CBD (significantly reducing the cost) and building a new alignment between the outskirts of Sydney through to central Canberra that can be scaled up to high speed rail (HSR) in future, a MSR link could provide a high speed connection between the two cities at an affordable price tag (the article quotes $3 billion, compared to the $15 billion for HSR, albeit on very rough calculations). It could also allow for transport between the CBD’s of Sydney and Canberra, but via each city’s airport, thus making the 2 to 2.5 hour point to point trip competitive with air or car travel. There would also be benefits for freight trains travelling between Sydney and Melbourne. With the chances of a Parramatta to Epping Rail Link (PERL) being built anytime soon fading rapidly (not likely to happen until 2036), Parramatta Council has begun to search for alternatives in order to meet its transport needs. The most recent proposal is a light rail network centred on Parramatta. Stage 1 of this network is 44km of light rail – consisting of a line from Castle Hill to Bankstown via Parramatta (1a), a second line from Westmead to Carlingford using the Carlingord heavy rail line (1b), and a third line from Dundas to Macquarie Park (1c). Stage 1 has been estimated to cost $3 billion, based on the cost of the Lilyfield-Dulwich Hill and Gold Coast light rail projects. Stage 2 involves a further 44km extension of this network along the Northwest and Liverpool T-Ways, as well as a loop between Parramatta and Olympic Park, a link between Castle Hill and Cabramatta via Blacktown, and linking Carlingford through to Epping. Stage 2 would cost an additional $6.5 billion. Parramatta Council’s strategy, to realise that the writing’s on the wall for the PERL and to push for something else instead, is a good one. But their tactic of pushing for this particular project seems questionable. It’s all about choosing the right mode for each area, and while I think light rail would be very well suited to some of the routes suggested, in other routes it would be like trying to fit a square peg through a round hole. Recently most new transport infrastructure in Western Sydney has been Bus Rapid Transit (BRT) in the form of T-Ways between Parramatta and Liverpool, Parramatta and Rouse Hill and Blacktown and Parklea (linking up to the Rouse Hill T-Way). There is also a significant BRT route on the M2 between Windsor Road and Epping, including 2 bus stations. The advantage of BRT is that it is cheaper than light rail (the T-Ways cost less than half per km than this proposed light rail network) and more flexible (buses aren’t locked in by where the rails go, so they can divert into suburban areas or overtake other vehicles). Where BRT falls down is on capacity and operating costs, light rail can carry more people at a lower ongoing cost. There are other benefits to light rail, people seem more willing to ride light rail than buses and they like the certainty of knowing that they go where the rails take them or that a tram will eventually come by when they see rails. But the key thing here about BRT is that when built as a fully segregated busway, as the T-Ways are, BRT is also quite easy to upgrade to light rail in future. It’s no surprise, therefore, to see the Parramatta Council proposal suggest doing just this. And it makes sense, these T-Ways should be upgraded to light rail when they start to run into capacity constraints. However, the proposal only includes this conversion in stage two. Stage one is basically two major connections: Westmead to Macquarie Park and Castle Hill to Bankstown. The former has a much better case for light rail than the latter. Westmead to Macquarie Park uses an existing rail line on its Western end, which is fully segregated, and has a reservation between Eastwood and Macquarie Park on its Eastern end, which would also be fully segregated. This would leave some on-road running, but this would usually involve replacing bus lanes, resulting in no net loss of road space for private vehicles. Buses would then be re-routed to act as feeder buses to connect commuters to the light rail or heavy rail lines. Castle Hill to Bankstown has very little of this. Most of it is along 4 lane roads which would involve either reducing them to 2 lanes of private vehicle traffic or sharing tram and car lanes. Bus lanes are limited, so are not an option as was the case with the previous route. There are few options to build light rail on new land without expensive land acquisitions as there are no reservations left along this alignment. My knowledge of the route between Parramatta and Bankstown is sketchy, but there is does seem like the roads are less congested and that light rail could feasibly be run on-road shared with private vehicles. So personally, I think a better option for stage one would be to merge the three lines into one line that goes from Bankstown to Parramatta and then goes through to Macquarie Park. The connections through to Carlingford and Westmead could also be built, but are not central to the core part of the line. This could then be followed up by converting the T-Ways to light rail and linking them to the existing system. Here are two videos from Flink Labs, the same people who designed a phone app that shows you a map of where buses are which proved so popular that it crashed the server (see the end of this post). One is of Sydney Buses (i.e. no private bus routes, so it is almost exclusively the inner city and Northern Beach routes, plus the Parramatta to Liverpool T-Way) and the other of Melbourne’s trains. Each uses GPS data and lights up the map each time a bus or train travels through a certain area. I love these sorts of maps, they make it so easy to instantly see how a system currently operates. 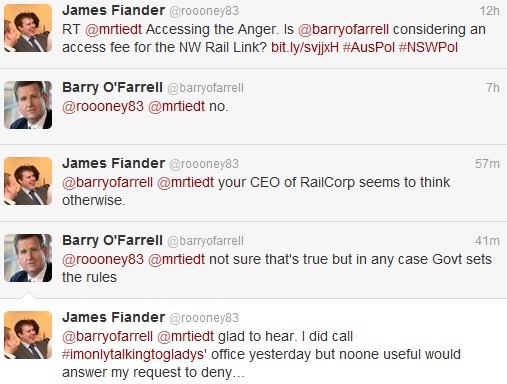 Northwest Rail Link to be privatised? His statement suggests that the line will not be entirely run by the private sector, but will still be partly run by a private company. The Herald’s report suggests that the model will be one in which the government pays the operator, rather than for commuters to pay an additional charge. There are two potential models for a government paid access fee. The first is to pay a fixed fee for access, which is similar how buses operate, where the government pays the operator for the distance traveled (regardless of the number of passengers) and the government collects all the fares. The other is to pay a fee for each passenger who uses the stations, which is the system currently used at Mascot and Green Square stations on the airport line, where the government pays the operator directly for the access fee that was previously paid for by passengers. Whether or not this is a good idea depends entirely on whether you think privatisation is a good policy option or not. Detractors will argue that it is cheaper for the government to build and operate transport infrastructure, and that by getting the private sector to build and/or operate it inflates prices due to higher borrowing costs and by requiring the company to make profits. Supporters will argue that a private company has more incentives to be efficient, which will result in lower costs in the long run, and that it removes risk from public hands.